Hi, and welcome to the Get Inky! Farewell & Welcome Blog Hop. You should have arrived here from La-Vie’s blog. If you happened to have stumbled into the hop mid-way be sure to start at the Get Inky! Challenge Blog for a chance to win a fun prize. The blog hop is saying goodbye to our old team members, and welcoming our new. I was a guest designer last time, and am a part-time design team member this go around. I am happy to be included again as Get Inky! makes a quality stamp, and all the girls are a blast to work with. For my project I choose to use the cricut cartridge A Child’s Year. I cut out a fairy and then replaced her wand with a flower. After she was glued down I used stickler and glitter for her wings. The flowers, and butterflies, are stamped with Blue Moon Creation’s build a flower that is part of the Love Bugs set. 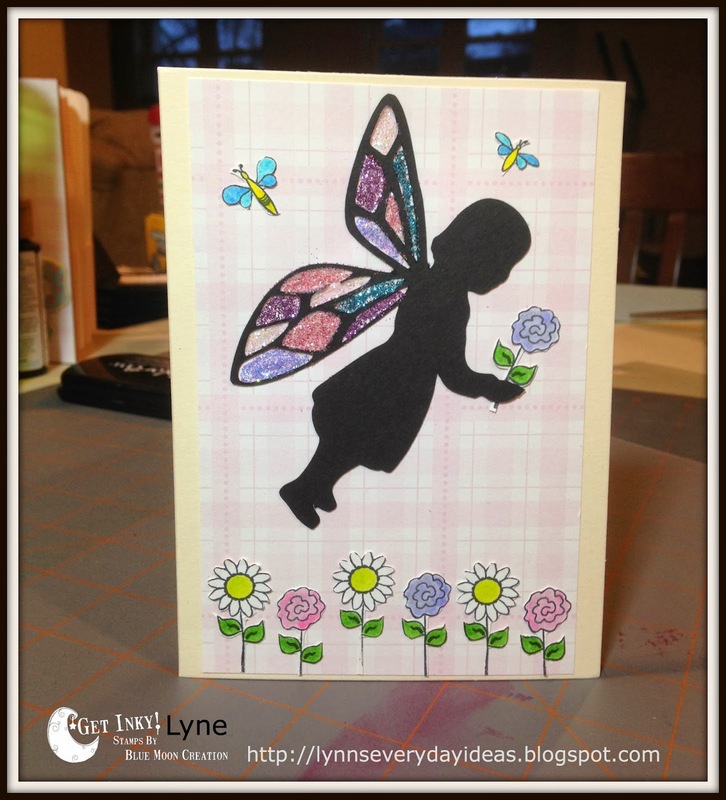 The pink and purple flowers were colored with a blender pen and my stamp pads. The green and yellow are wink of stella pens. They give a slight sheen/glitter, but not a whole lot…hence wink I guess. I will also be offering a prize! 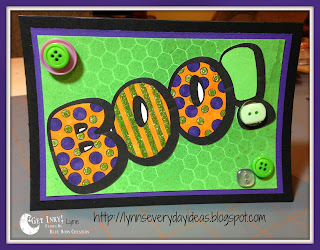 If you leave a comment, and follow my blog, you’ll be entered to win the card I created as well as a 6×6 paper pad to help you create some cool things! If you follow me on Facebook or Twitter, and leave another comment for each, you’ll receive an extra entry. The links to where else you can find me are in the upper right corner of my blog. I’m so glad you stopped by and look forward to inspiring you further. Now off you to go to Susan B to check our what she created. 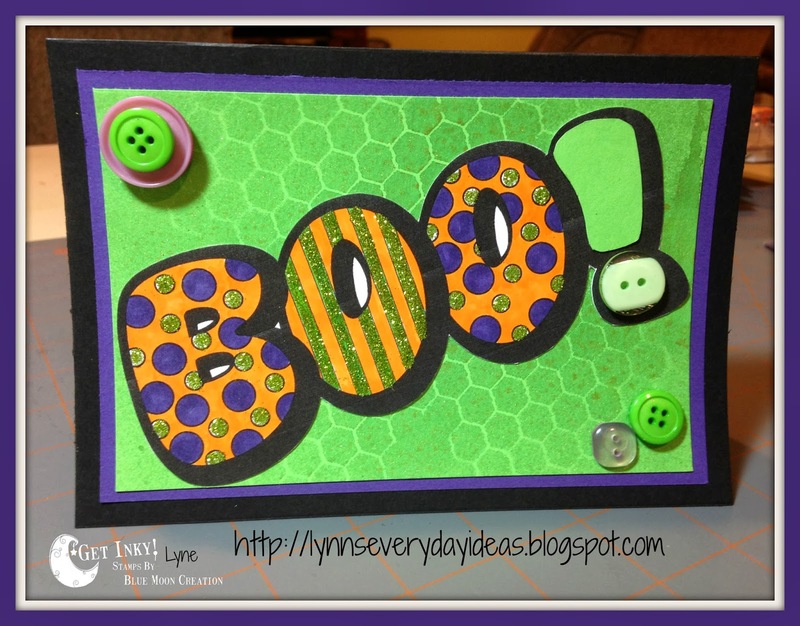 I’m back again to post inspiration over at Get Inky Stamps by Blue Moon Creations. Their challenge right now is Onward and Upward. This challenge really got to me! I made a card probably two months ago and let it sit as I wasn’t exactly happy with it. The more it sat the less I liked it, and couldn’t bring myself to write the post…so I started over. Boy am I glad I did. I love this card! I misted white paper with Heidi Swap tinsel to give a night sky twinkle effect, and then used the stars and Happy Birthday sentiment from Get Inky’s sailboat set. 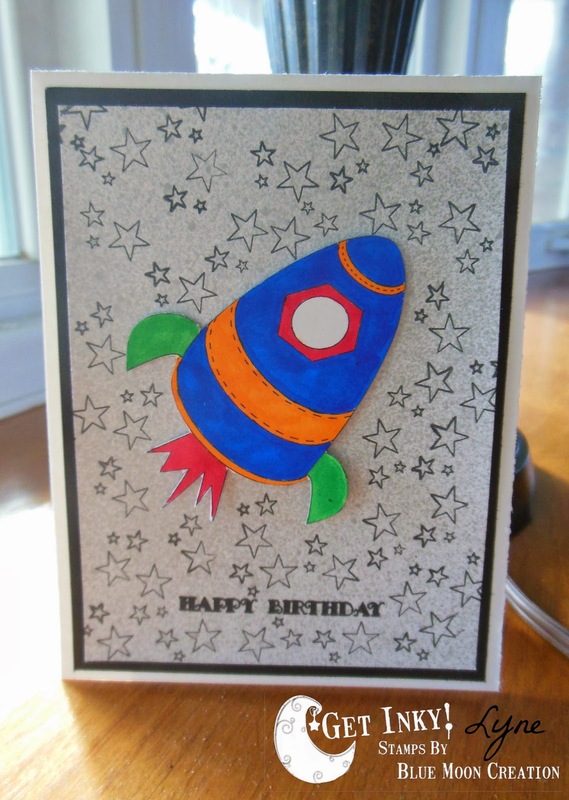 To finish it off I printed and colored their digi rocket in fun kid colors and voila…a card I love! I probably love it so much as we just had a 3 year old Buzz Lightyear party hear and my house and I must hear “To Infinity and Beyond” 300 times a day! What are you all creating for this months challenge? If you are looking for the Kiwi Lane blog hop – it’s the next post down. I am so excited to be showing you my first guest designer creation for Get Inky Stamps by Blue Moon Creations. This was my first time using digital stamps, and I sprang for some Copics too! Their challenge right now is to use fall colors. I used the Funky Flower digi set, and my sentiment was from the Sailboat set. I loved with the flower set that you got four of the same shape flower, but that each one was a different pattern inside. It made them all interesting, but still co-hesive. I used three different colors of copics as well as some random brads and gems that I had in my stash. Will you be linking up for their challenge? I’d love if you followed me to see all my new ideas! I have all my links in the upper right corner. Thanks again!